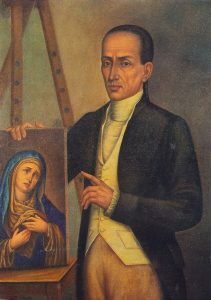 José Campeche y Jordán is Puerto Rico’s first and most significant painter of the 18th-century. He was born on January 6, 1751, to Tomás Campeche a freed-slave who purchased his freedom and to María Jordán originally from the Canary Islands. Of Afro-Caribbean descent, Campeche learned his father’s trade of decorator and gilder as well his first lessons in painting. Working as a gilder he was the person responsible for covering in gold paint altars, images, and frames. Although he painted portraits of famous people in San Juan, he was most recognized for his paintings of religious imagery. Mostly for the Catholic church and the Virgin Mary. José Campeche’s artistic influence came from Luis Paret y Alcázar. Paret y Alcázar is one of the most recognized painters of Spain’s royal court of the 18th-century. He took him under his wing and taught him styles, poses, and lighting of royal portraits. José Campeche’s work can be viewed at the Smithsonian American Art Museum. In Puerto Rico, Museo de Arte de Puerto Rico, San Juan, Instituto de Cultura Puertorriqueña, San Juan, Museo de Historia, Antropología y Arte, Universidad de Puerto Rico, Rio Piedras Campus, Museo de Arte de Ponce and in Venezuela. Today, he’s considered one of the most important Hispanic American painter of his time. In our last visit to Puerto Rico, I was excited to purchase the children’s book: José pinta a la Virgen by author Carmen Leonor Rivera-Lassen and illustrator Mrinali Alvarez Astacio. This is a delightful, and colorful Spanish picture book of Campeche’s childhood and his beginnings. The illustrations are bright and colorful depicting Campeche’s life. The author writes about Campeche’s daily life following his father a decorator and gilder, and his ability to memorize paintings and then recreate them. At the end of the book, you’ll find a vocabulary list and Campeche’s biography. Though this book doesn’t state the age range I’d say it’s geared for children ages 7-10 years old. A fun enrichment activity to complement the book is to paint and/or color an image of the Virgin Mary. I found some cool downloadable printables over at The Kennedy Adventures. Instead of paint, we used oil pastels (the oil pastels make the colors pop like in the illustrations). You can read more about José Campeche in Spanish here, and in English here. Thank you Dianna for your free printables!! !